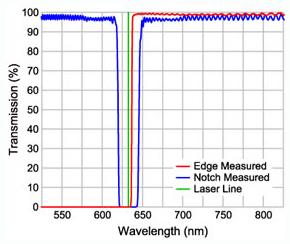 The RazorEdge edge filters and the StopLine notch filter are both available with OD>6 blocking of the laser line. The main benefit of the RazorEdge filter is the very narrow transition width, allowing users to measure even the smallest Raman shifts. Although the StopLine notch filters do not transition as close to the laser line, they are tunable from 0° to 14°, or 1% of the laser line to allow users to shift the bandwidth in response to variable laser lines. The RazorEdge filters are tunable as well, from 0° to 8°, or 0.3% of the laser wavelength. In addition to the greater ability to angle tune, the notch filter's dual passband allows users to measure Stokes and Anti-Stokes shifts without changing filters.